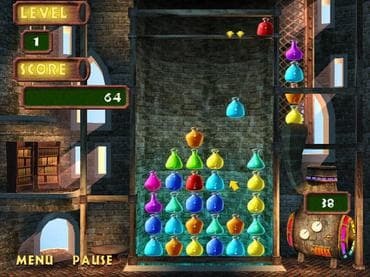 Arrange identical magic potions in groups of 3 or more to keep them from overflowing the screen. The situation gets considerably more complicated when various special magic potions appear, so think twice before you make your next move. Download free full version windows game today and enjoy unique twist to the matching genre. Free Game Features: - Family friendly puzzle game; - Amazing graphics and relaxing soundtrack; - Unique twist to the matching genre games; - Unique power-ups; - Save / Load game option; - Game statistics; - Free full version game without any limitations. If you have questions about Magic Drop game, please contact us using this form.